Five years ago when first we visited Idaho, Coeur d’Alene was a hoped-for destination but one we missed for lack of knowledge on how to find available campgrounds. This time we spent a few days in the area exploring from our base camp at the Coeur d’Alene Casino fifteen miles or so outside of town. Indian Casinos sometimes offer RV parking but more often do not. When they have RV spots typically the incentives to gamble are sparse, but now and then you’ll encounter an exception. This was one. Their overnight rate is $20 just for electricity. But the Coeur d’Alene area is such a hot ticket that’s a bargain – be sure to arrive with a full water tank and empty waste tanks! Upon arrival we learned that by joining their Preferred Losers Club (I forgot its actual name) they loaded our guest cards with $15 each of Free Gambling Money. (There’s rich irony here: we took their land and introduced them to firewater, and now their casinos fleece us of our Social Security.) I like Blackjack when played as a table game with a dealer, but not as a video game. Most states regulate video blackjack as slot machines, meaning that the house may set the payoffs pretty much anywhere they like, and always below the card game rate where a fairly skillful player will lose on average at around a 2% rate. But this casino has no dealers, or croupiers, or even keno runners. It’s all slots. So, as with blackjack, our plan is to get ahead early and cash out. These machines demand a dollar bill to commence play. After your dollar is gone, the Free Money is bet. We changed machines a few times, losing a buck with each move, but winning here and there. The payout does not come in a torrent of pennies or nickels but the machine makes that sound for about as long as it would take to pour out real cash. Kat won $17 on a penny slot and did those coins ever jingle! She played her freebies plus mine and in the end came out ahead by $30. We spent her winnings and a $8 Fathers Day coupon on prime rib with all the trimmings in the casino’s nicest restaurant. Good as it was, that chow was surpassed by a Road Food dump, Meltz, in downtown Coeur d’Alene. 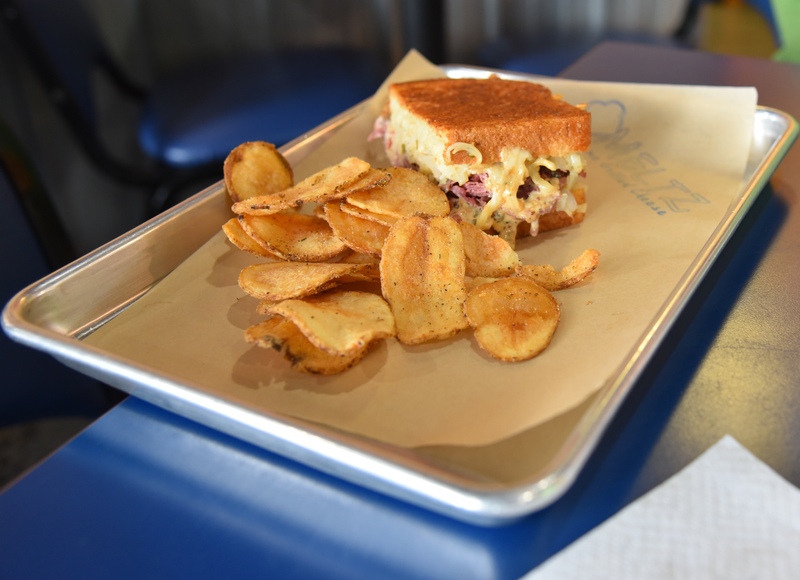 We split a Rooben Evolushun with a wonderfully crisp and un- greasy crust, overstuffed with corned beef, homemade kraut, pickled onion, and Swiss cheese with frico along the edges. It was so close to perfection. We didn’t get to see much of the lakefront which was overrun by people viewing an annual festival at the city park, The Car d’Alene. About 20 categories are judged including my favorite, Best Flames. 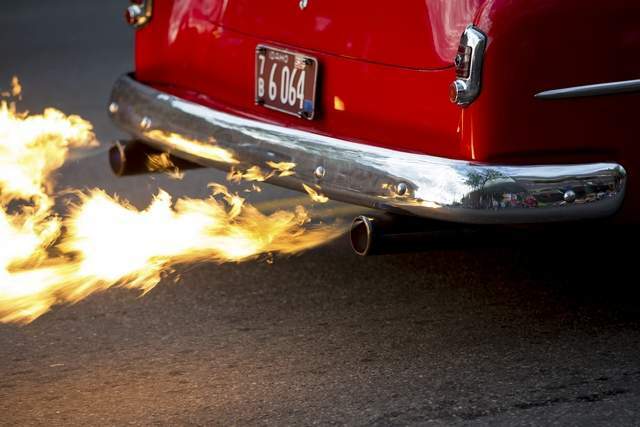 Somehow these fools trick their vehicles into blowing red and orange fire out their exhaust pipes. It’s stupid for sure, but fun … if it ain’t your ride. We visited Coeur d’Alene in fall 2014 (pre-RV) and really enjoyed the city and pretty lake. We visited primarily to ride the bike path there, and it was on the way from other spots that we were visiting that fall. The annual Ironman Triathlon there was a couple of days after our visit, so town was busy when we were there as well with athletes rolling in for the race. We even got to bicycle alongside some of the athletes training a couple of days before the race! 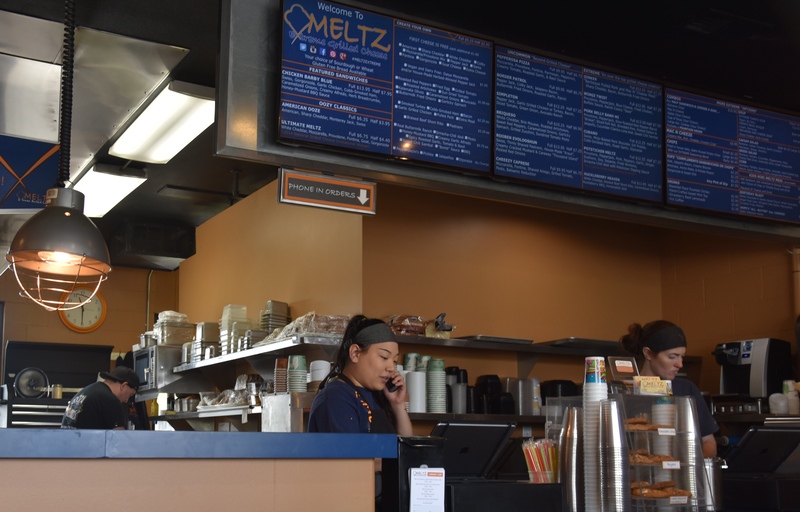 Meltz sounds amazing — we missed it, unfortunately.